The below artworks are the most important by Johannes Itten - that both overview the major creative periods, and highlight the greatest achievements by the artist. Artwork description & Analysis: Although Itten painted this color abstraction prior to his arrival at the Bauhaus, it includes many of the fundamental principles that would be central to his teaching there. His use of geometric shapes, including the dominant spiral and repeated circles and rectangles, along with his exploration of the color spectrum preview his later interests. Artwork description & Analysis: This student work was completed in Itten's Vorkurs preliminary course, highlighting the class's emphasis on experimentation with materials and studies in contrast and form. This was a dramatic break with traditional art education, which emphasized copying from plaster casts and prints. Trained as an elementary school educator, Itten was deeply influenced by the pedagogy of Friedrich Froebel, who argued that learning was accomplished through play. Itten would propose a visual or structural challenge, often based on the exploration of ordinary materials, and his students would have several days to prepare their models. They were forced to work intuitively, in response to the materials, to develop creative solutions. 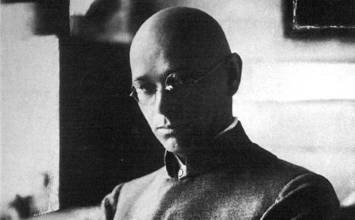 Rather than grading individual efforts, which he believed could stifle this creativity, Itten would speak to general errors made by students and then allow the class to choose the most successful work. This model of open-ended experimentation, group dialogue, and individual expression has become a cornerstone of art education. Artwork description & Analysis: The founder of the Bauhaus, Walter Gropius, was an architect by training and architecture remained the ultimate goal of Bauhaus pedagogy, as a unification of all other media. Itten designed several architectural structures during his tenure at the school, most of which were based on elementary geometric forms in dynamic arrangements. Indeed, this architectural sculpture was a prototype for a never-realized public monument. Descriptions of the proposed project in Itten's diaries suggest that it might have been intended as a beacon for the Weimar airport. The model was installed outside of Itten's studio at the Bauhaus. First published on 25 Jan 2017. Updated and modified regularly.